Ayfer Simms casts her poetically rich gaze over the most recent retro-pop, contemporary electronica, offering from Greek “crooner” Sillyboy. 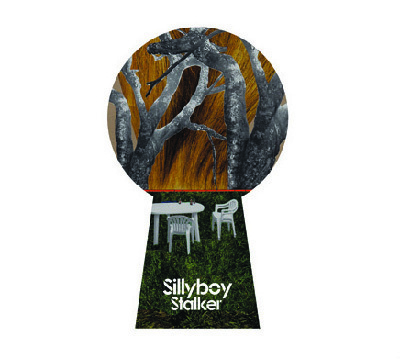 Silly boy is a crooner, with a half husky, half sizzling soft vocal cords pushed to a raw state of “peach(ness)”, in a field of well-designed mantra, melodies that rest on the listener’s shoulder, bouncing back and forth, up and down handsomely. The world of Sillyboy is a subtly light Zen dance music with occasional guitar riffs and synth, evocative of the 80s. The man takes with him an imaginary gang, a toned down version of Michael Jackson’s doomed creatures, absolutely trimmed, leading them through his steps, creating a choreography-like buzz, on the spot, in the mind of the listener at least. Some tracks like “cry like a girl” are pounding and carry on an edge of the dirty bad boy, but rather Silly boy is perfectly squeezable even in his nostalgic moody attitude. The tune Stalker, “Whenever I feel sad, I stalk her”, is an appealing sympathetic pop, grabbing, and friendly one despite the potentially chilling connotation of the title. Throughout the album, the music is solitary and celebratory at the same time. Leads you to a seemingly obscure path, at night, but then throws clean looking dancers at you, the asphalt becomes the stage of the malleability of their limbs. And then you are one of them, shaking, sultry and confident out in the street, letting go, feeling good, forgetful, and tranquil. If there is a single word to describe the album, it would be unassumingly-cool-and-cadenced-electronic-vintage-pop.